There are a lot more worthy observations about the weekend that I could include about love, peace, faith, family and the true meaning of Christmas, but I chose the two below for this blog today. I hope that you had a wonderful weekend! If you didn’t, e-mail me at kelleysbreakroom@gmail.com and let’s talk that mess out. #1 Older people cannot pronounce most words in the STAR WARS movie series. Surrounding discussions over my 6-year-old son’s new Star Wars bedding and TONS OF STAR WARS STUFF were heard “RD22” (translation: R2D2), “Attatat” (translation: AT-AT) and “Bobbahfett” (translation: Boba Fett). Goodness gracious. I’m going to go ahead and offer them free tuition to the local community college course I don’t teach (because it doesn’t exist but totally should) called, “Introduction to Star Wars: A Course About the Force”. 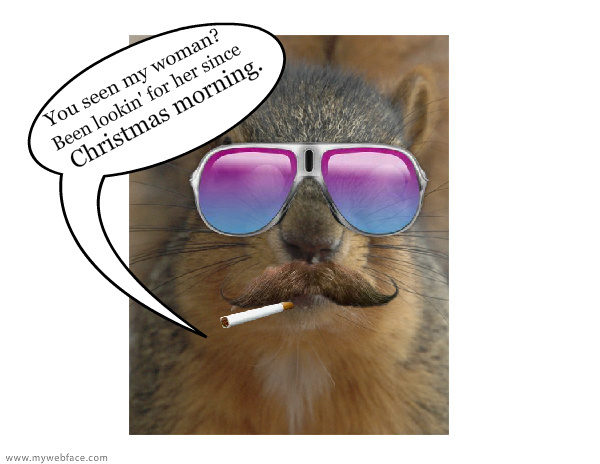 #2 Squirrels are some committed lovers (and I absolutely LOATHE the word “lovers” but it’s the only one that will do). Christmas morning I witnessed two cute squirrels chasing each other on the top of the fence. Delighted with my discovery of nature at it’s best on such a magical morning, I pointed out the sweet little things to my 2 1/2-year-old son and mother-in-law. Just as I did, those two squirrels WENT TO TOWN right there in front of my staring baby boy for him and the whole world to see. I should have actually said that the male took the female and made her his…love slave. Given his excitement and extremely high level of adrenaline, the female began to fall off the fence. She was HANGING from the fence BY ONLY TWO OF HER DANG FEET trying to save her life with the MALE STILL ATTACHED AND TAKING CARE OF BUSINESS. I sure hope she found that Santa had left her a more sensitive mate when she returned home that day. P.S. In case you are wondering, my little guy probably thought they were wrestling. My MIL and I both laughed QUITE A BIT. My 6-year-old came in and interrogated us about what in the HECK we thought was so funny. I am sure we said something about the squirrels telling knock-knock jokes (more like knock-knock-you-up jokes). On another note, I received an e-mail over the weekend from the website, “First Class Blogger Award”, notifying me that I had received an award from them. Their website is just beginning, is comprised of several bloggers and describes it’s aim as being to recognize blogs that they believe should have a larger following. Their first installment of awards included mine and seven other blogs on a variety of topics. I am definitely going to check the rest out and I encourage you to do the same (click here)!Thanks, FCBA!